Endjinn is a granular synthesis module designed to function with BEAP (Berklee Electro Acoustic Pedagogy) a modular synthesis environment built with Max. I’ve just started tinkering with BEAP and am really excited by the possibilities. While Max is great for building things from the ground up or for creating complete devices, it’s not so conducive to making sounds quickly. BEAP adds a functional level of modularity to Max where you can sketch ideas down and make sounds fast. When you save a BEAP patch it also saves all your settings, so you can create useful patches to make specific sounds and then come back to them easily. I’ve always thought that granular synthesis is especially useful for sound designers; as we tend to have extensive sound collections, we also have plenty of audio to use as source material for granulation. Building Endjinn was partly just a learning experience for me as I had used many granular synths before and had a good grasp of how the process worked, but had never designed one from scratch. But I was also curious to try and create a device which differs from those already out there. Of great influence was the Monolake Granulator which I believe is one of the best sounding granulators around. I’ve also used the grainstretch~ external within Max quite a bit – it is also very flexible and also has some nice features. There are also a whole bunch of other synths, tutorials and other influences here (especially from the C74 forums – thanks to those who routinely share their knowledge there). Endjinn is a synchronous four oscillator granular synthesiser, each generating between 1-4 overlapping grain streams. CV (control voltage) from any of the BEAP devices can be used to scan grain playback over a sound file in any pattern or direction. CV can also control grain rate and a pitch multiplier for all oscillators. The usual granular parameters are present – random pitch, position and volume per grain. Unusually for a granulator, grain rate can also be very slow – down to 0.1hz and through to 100hz, so you can effectively create slowly cross-faded soundscapes. Phase distortion can be applied to the playback of individual grains, with user-defined shapes. Similarly, the grain envelope can be designed within the synth or loaded in as a separate sound file. Pitch and rate parameters can be ganged together for fast tweaking and setting at precision increments. 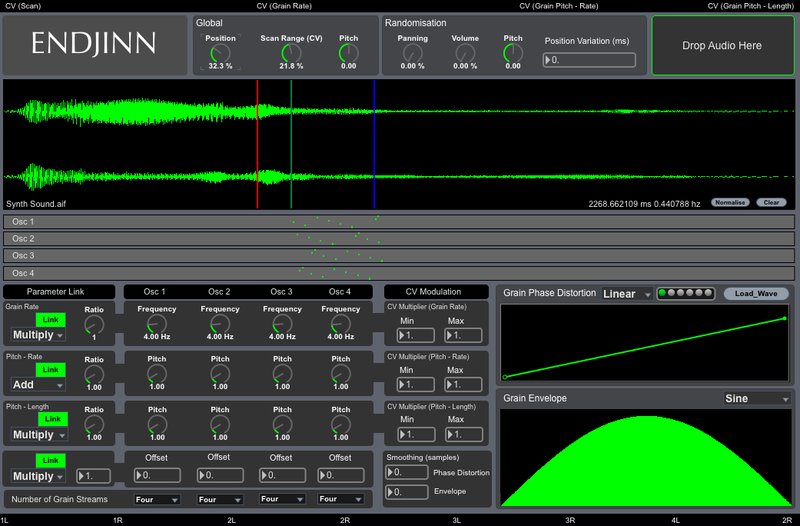 Panning – ­Panning randomisation for each grain, for stereo sources this effectively mixes the left and right channels together, 50% allows a maximum of a 50/50 mix of both channels on either side, 100% allows for a full swap of the left and right channels, with every possible value in between. Volume – Volume randomisation per grain, 0% means that all grains will play at 100% volume, 100% means that each grain will play somewhere between 0-100% volume, 50% and grains will play between 50-100% volume. Pitch – Randomisation of pitch per grain, either up or down up to one octave. Position Variation – Adds a random value to the start position of each grain, set in milliseconds. Frequency - Frequency of grain generation, between 0.1hz – 100hz. Pitch by Grain Rate - Pitch control by varying grain playback rate, this does not affect the grain length. A value of 0.5 will play the grain back at half speed (ie half the pitch, or one octave down). A value of 2 will play the grain back at twice the base rate, or an octave up. Pitch by Grain Length - Pitch control by varying length of the sample taken by each grain. A value of 0.5 will decrease the length of sound sampled by 50% for each grain, effectively reducing the pitch by half. A value of 2 will increase the length of sound sampled by 100%, effectively doubling the pitch. Offset – Adds a +/- offset to the grain start position, allowing the oscillators to play from different points of the sample. 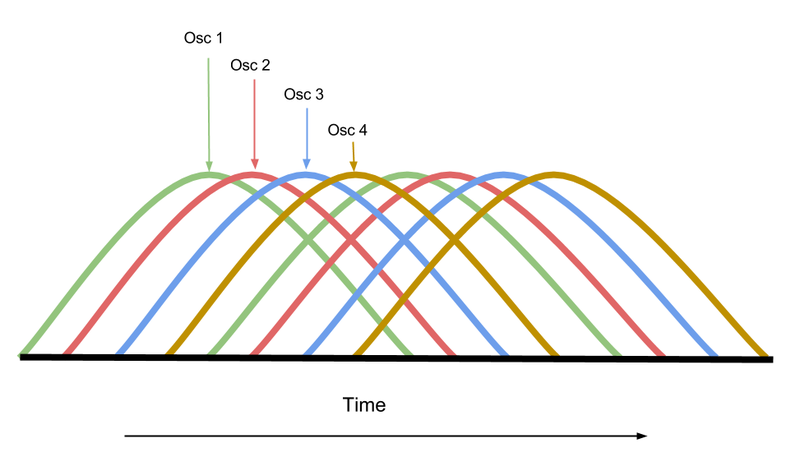 Grain Streams – Defines the number of grain streams used by each oscillator. These overlap as shown in the diagram below, Visual feedback of this process is displayed on the grain position bar. Waveform Display - The waveform display shows left and right channels of the loaded sound file. The red indicator displays the scan start position, blue shows the end position and green the current position. The file name is displayed in the lower right-hand corner. Grain Position Display - Displays the playback position of each grain. The display will adjust to the amount of streams in use for each oscillator. CV Modulation - Inputs 2-4 provide CV control (-5v through till +5v) over multipliers affecting grain rate, pitch by grain playback rate and pitch by length of sound sampled per grain. For example, if you connect a 1hz triangle LFO to inlet 3 and change the CV multiplier to min:0.5 max:1.0, then the pitch will fluctuate between 50% - 100% and back again, as the LFO moves through its cycle. Grain Phase Distortion - It is possible to distort the linear ramp that controls grain playback, affecting the pitch and harmonics present in each grain. There are a selection of presets which show some basic behaviour here; preset one is set to linear playback forwards, two for backwards playback, three is a decelerating ramp, four a rough triangle, five and six are more complex shapes. Custom shapes can be defined using the breakpoint generator (Shift-click removes points, alt-click-drag adjusts curves in curve mode) or through loading a sound file to be used as a transfer function. Grain Envelope - Defines the shape of envelope applied to each grain. The default shape is half a cycles of a sine wave that should provide smooth playback. As with the phase distortion, user specified shapes can be used or sound files can be loaded and used as grain envelopes. Output Stage - Each oscillator has two outputs at the bottom of the device, one left and one right. Endjinn will actually run without all the BEAP stuff, but it is designed to function with the BEAP system, so if you install BEAP first you can then expand on Endjinn with all the cool BEAP modules. One is just the patch itself, this is called Enjinn 1.1.maxpat, the other is Endjinn with a BEAP output and some LFO modules - you should start there. - Unusual 'scan' effects can be acheived by using an LFO to scan the waveform with harmonically pitched oscillators. - Glitchy sounds can be achieved with custom envelopes and user defined phase distortion shapes.